Given by L. K. Elmhirst, Esq. A woman's fine linen smock of the period 1620-1640. 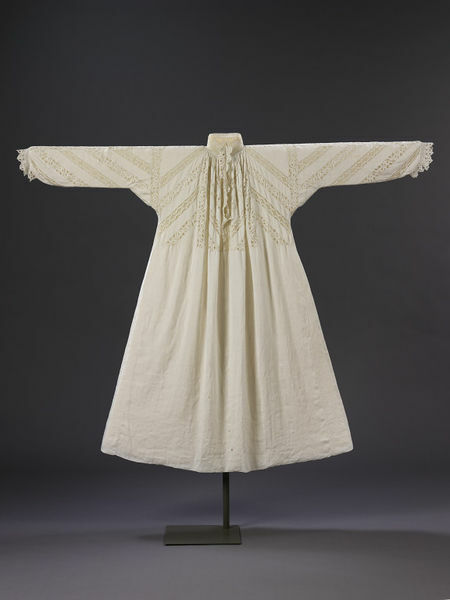 Women's smocks were always made with triangular gores in either side and the high neck and long sleeves of this example, trimmed and inset with bobbin lace arranged in a distinctive diagonal pattern, were clearly meant to be seen when the wearer was fully dressed. The lace insertions are of the same design, but two different qualities, one finer than the other. and five different patterns of lace are included. A garment with so much lace had to be handled and cleaned with great care. Normally lace trimmings at the neck and wrist were taken off before laundering. However, the lace insertions in this smock could not be removed, so the whole garment had to be washed very gently. The smock was originally in the Royal Collection at Windsor. It was given by Queen Victoria to one of her Ladies-in-Waiting, who bequeathed it to the donor's aunt. Long smock made of linen, with long sleeves, collar and cuffs. It is decorated with insertions of bobbin lace, in two qualities using the same pattern, but one is finer than the other, and five different patterns of lace were used. The nsertions are in the sleeves, upper front and back of the smock. The collar and cuffs are made of and edged with bobbin lace. The top half has the insertions, which run vertically down the back and centres of each side of the front, and along the shoulders and down the arms and round the arm holes. Hand-made and hand-sewn. 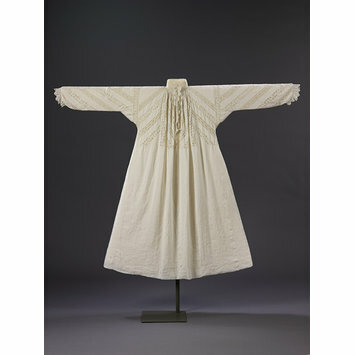 Leonard Elmhirst donated the smock, said to have belonged to Queen Elizabeth I, to the V&A in 1959. According to Elmhirst's family history, Queen Victoria had given it to one of her ladies-in-waiting, who gave it to Elmhirst's aunt. George Wingfield Digby (Keeper of Textiles at the time) was somewhat doubtful about the attribution, which the date of the lace establishes as too late for Elizabeth I, but recognised it as an extremely fine garment.